Now that Spring has sprung and summer is right around the corner, here is the second part of some Pretty Ideas for Outdoor Spaces. Please feel free to upload some of your pretty ideas for your outdoor space. 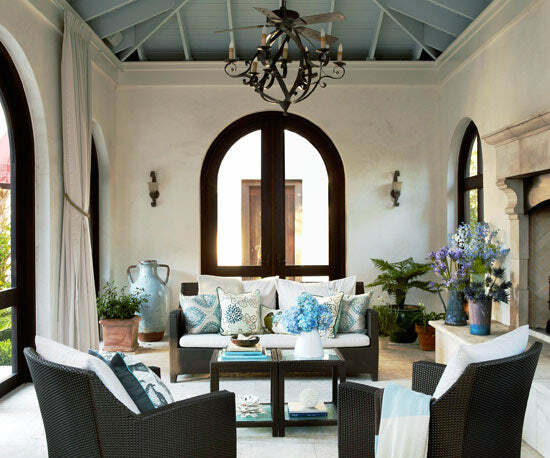 Stone walls and a dramatic pitched ceiling make a wow-worthy statement in this sun porch. The ceiling was painted blue, which draws the eye upward and emphasizes the height of the room. The blue color of the ceiling is repeated and echoed through the various patterned throws on the sofa and chairs. 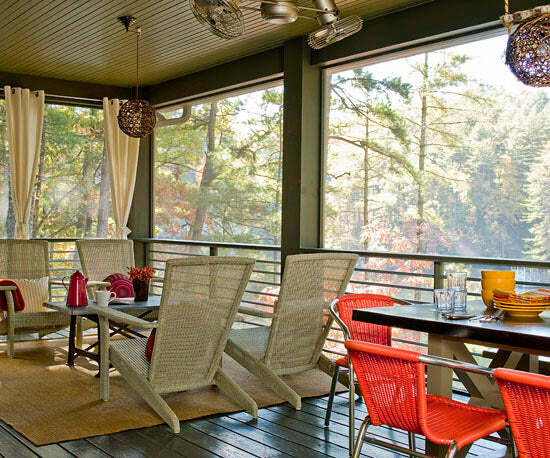 A large dining table and camp-style seats offer plenty of room for a crowd in this screened porch. Candles atop a low-hanging metal beam incorporate subtle warmth and ambient lighting to the space. The bundled branch coffee table nearby also makes a nod to outdoor living. A four-season porch design for casual entertaining is enhanced by equally casual furnishings. Adirondack chairs are an always-welcome classic, perfect for lounging. In this space, the design was adapted into a sofa, which easily accommodates two people. 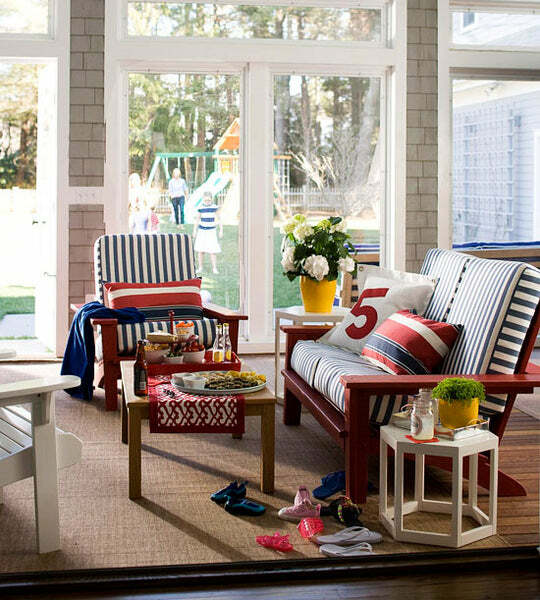 An infusion of red, white, and blue in striped motifs creates a nautical look that exudes summer style. An infusion of airy cottage style is the perfect complement to the flood of natural light that fills a window-lined enclosed porch. Mimic the look of a classic cottage front porch by installing beaded board on the ceiling. 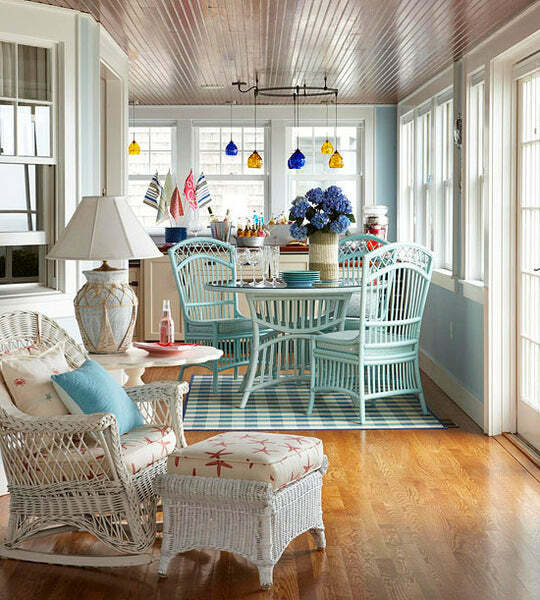 For full-on cottage style, use plenty of wicker accessories, flowers, and soft, bright colors like the frothy aqua on this dining room set. If you're enclosing an open-air porch, create continuity by using the same trim and window styles in the enclosure that's in the rest of your home. 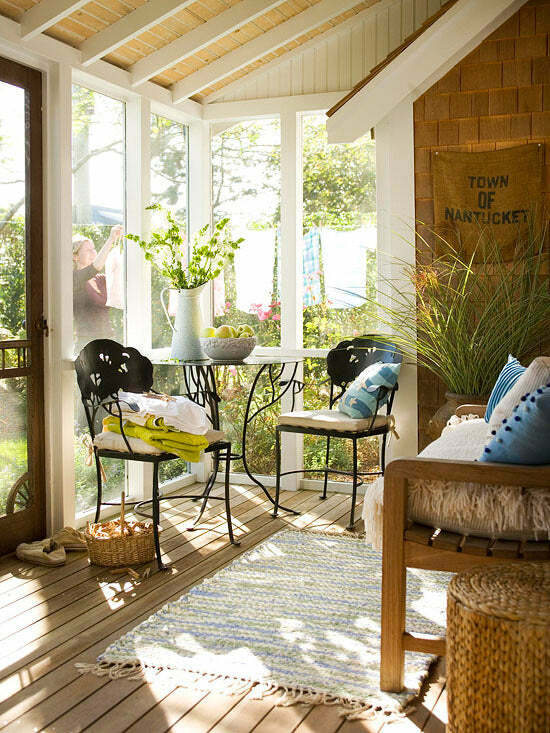 This screen porch is a breezy spot to spend spring, summer, and fall days. 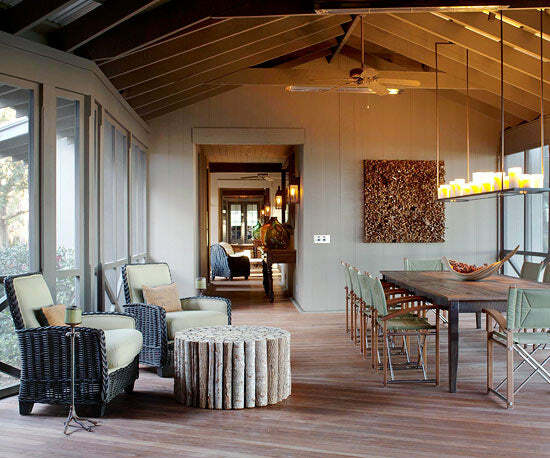 A light stain on the porch floor, white furniture and walls, and a wood table provides a neutral backdrop. Bright accents on the pillows, vases, and candelabra fill the space with color. For updates on a budget, limit bold colors to accessories. They are less expensive than large pieces of furniture and easier to update when you crave a change. This all-white porch desperately needed a color infusion. Plenty of pink came to the rescue, adding a soft, feminine touch to the stark space. A few potted plants bring a dash of the outdoors into this screened-in space. A savvy furniture arrangement makes the most of the porch's spacious footprint—a conversation area sits adjacent to a dining table and chairs, providing two seating zones for the space. This stacked-stone fireplace not only adds warmth to the screen porch, it also acts as a privacy screen, partially blocking the view from the outside into the porch addition. To give your porch substance, add in architectural mill work, such as these the simple pilasters with columns. 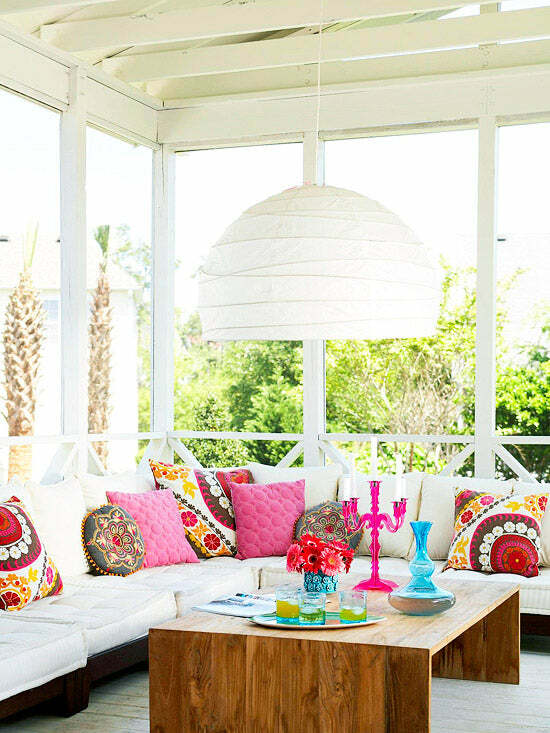 This screen porch gets a punch of color from bright furniture and accessories that can withstand the elements. 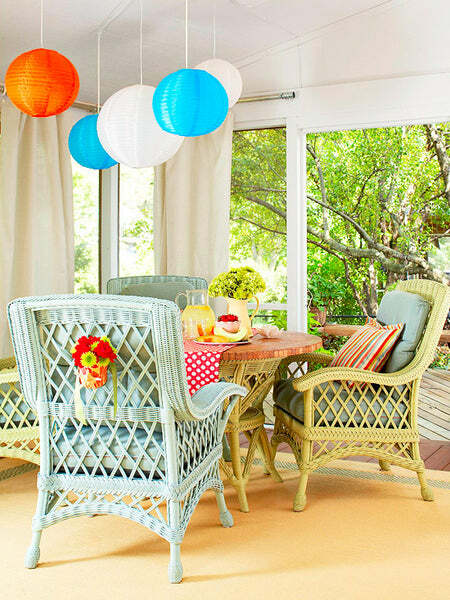 Colorful outdoor-grade wicker chairs and zippy vinyl lamps that mimic paper party lanterns pop against the white walls and window treatments. 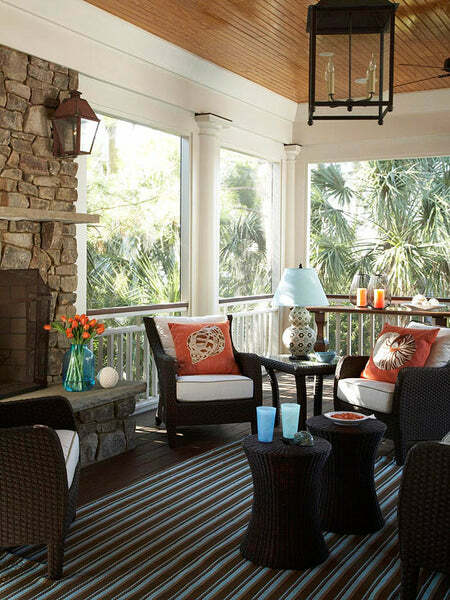 Treat an indoor porch like you would any other room by filling it with furniture, soft accents, and light fixtures. 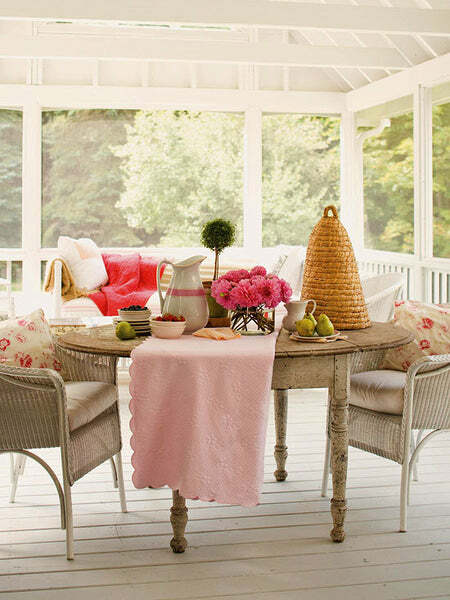 The woven table brings warm-weather style to the porch. 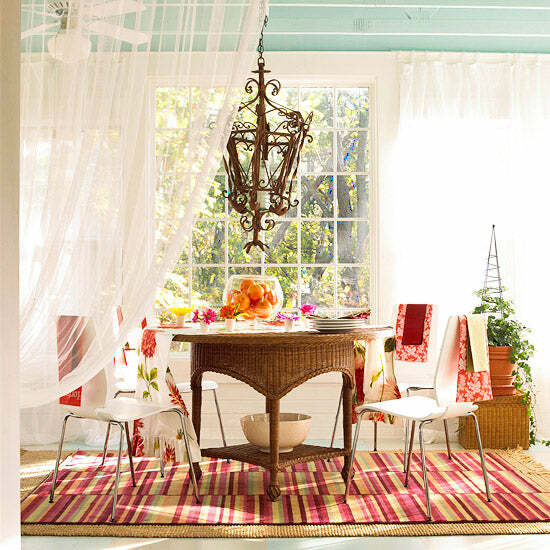 An indoor-outdoor rug adds color and anchors the table and chairs. An antique chandelier provides light and elegance. Gauzy window treatments and colorful table linens complete the porch's casual yet glamorous look. 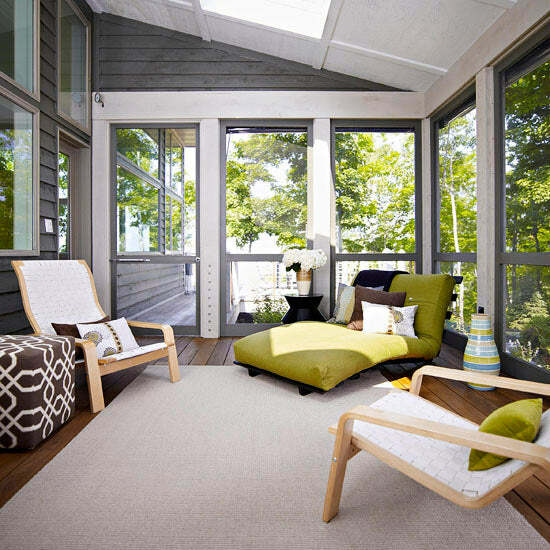 Make the most of a small porch with slender furniture. A small bistro table-and-chairs set adds functional seating to this home's casual porch, while not overwhelming the tiny space like a larger set would. Give your porch a boost with a little bit of paint. Revive worn chairs with a few coats of paint in a bright hue. Or try painting your door a striking color. Black paint turns this ornately trimmed door into a worthy focal point. The muted khaki-and-olive palette on this porch needed a little vibrancy. And that's what it got, thanks to a few raspberry accents and orange chairs. As with any room, texture has the power to transform—it's another element that gives this room life. Wicker chairs, a jute rug, and billowy curtains soften the crisp lines of the porch railings and columns. Comfortable pieces of furniture, like these lounge chairs and chaise, add to the inviting space of a light-soaked sun room or enclosed porch. For added comfort, incorporate plush pillows and a soft area rug. 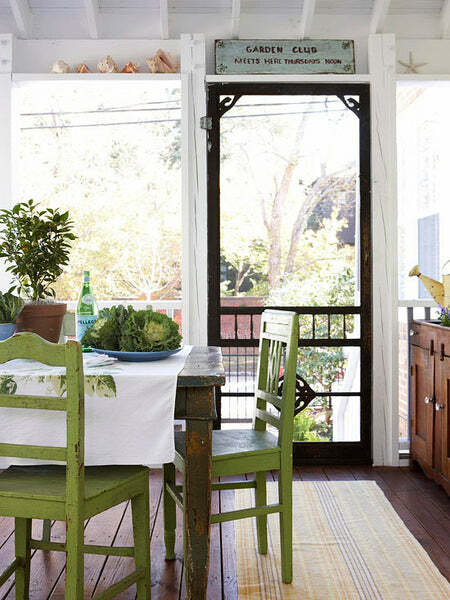 Add the functionality of a dining room to an enclosed porch with a few basic furniture pieces. Start with an intimate round table and comfortable chairs, then incorporate a sideboard, credenza, or buffet. A versatile piece of furniture like this one adds storage as well as a place to set up food and drinks for a porch dinner party. Choose from more than 400 house plan designs that we offer in a wide range of styles and sizes. Some of our more popular house designs include European-inspired Georgian and palladian homes, English manor house plans, Tuscan-style Italian villas, French chateaux, and colonial house plans. Tuscan-style villas range from 1800 to 14,814 sf; Newport classic house designs range from 1500 to 5000 sf. Our starter castles, mansions and estate homes are designed in the grand tradition of some of the most impressive homes in the world. Please feel free to search our house designs offered. Our plans have been built around the globe, from Canada to Dubai, and one could be just for you!